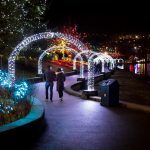 Metro Vancouver’s largest, free outdoor lights display! Take in the dazzling lights display in the tranquil setting starting Saturday, Nov. 24 to Sunday, Jan. 20 from dusk until 11 p.m. nightly and through midnight on New Year’s eve. Saturday, Nov. 24 from 6 – 8:30 p.m.
We’ll have live entertainment, food trucks, buskers, roving entertainers, family crafts and more!